French Emblems: Emblem: Amoris ignis perpetuus. The undying flame of love. Illinc ut rapido male liquitur à rogo. Absens tabifico haud minùs ulcere carpitur. See how on the one side its own flame is consuming the smooth torch, And on the other how badly it is being melted by the fast-burning bonfire. The unhappy lover is consumed away by the fire of seeing the girl he loves: But when he’s parted from her he’s no less eaten up by wasting sickness [lit. sore]. Parvam, florea virginitas sua cùm foret. 1. Grammarian of the 3rd century AD (or 2nd century), wrote a treatise on metre. 2. Atthida (‘Little Atthis’) refers one of the female companions of Sappho, mentioned by name in several of the fragments of Sappho’s extant poems. 4. 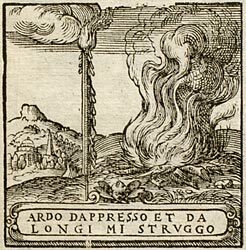 The Italian derives from Petrarch, “da lunge mi struggo et da presso ardo”, Rerum vulgarium fragmenta, sonnet 194.14.